Sorry to be six years late with this comment, I have only just spotted it! 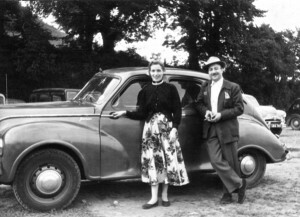 I am the Press Officer & Librarian of the Jowett Car Club and liked the picture of “Mum & Dad’s Jowett Javelin”. I was wondering if you could tell me any more about Mum & Dad, and wonder if you have any other pictures of the Javelin with its registration number visible? If you did, I would hopefully tell you more about the car.